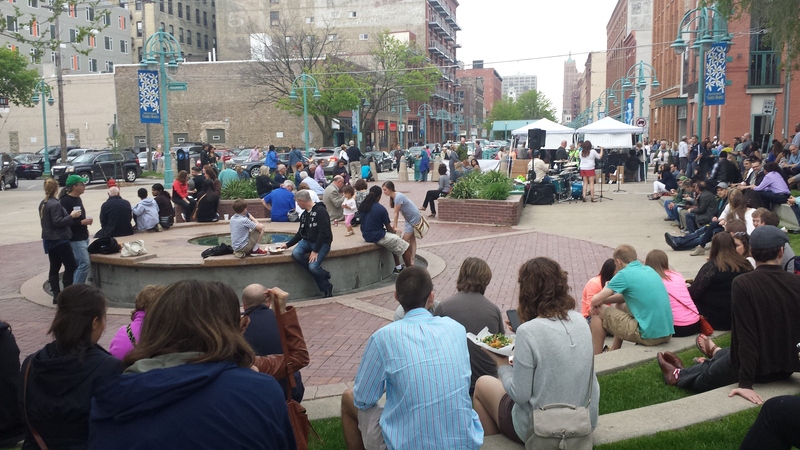 Milwaukee Street Eats 2015 – May 15th, 2015 | Feed Me, Milwaukee! 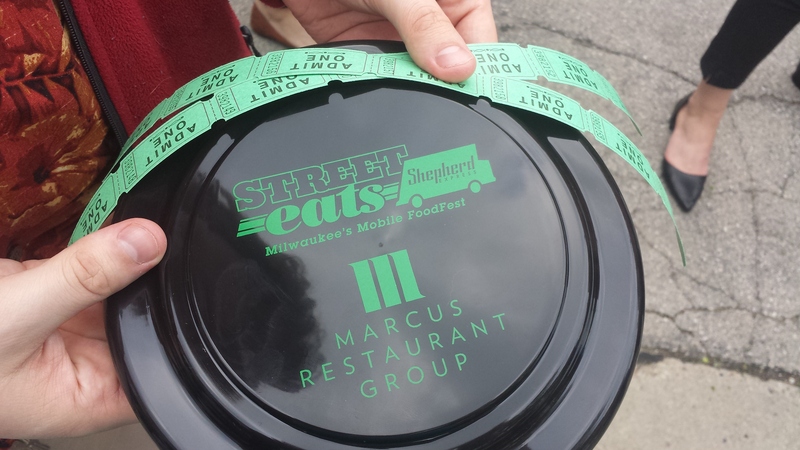 This past Friday, Shepherd Express played host to the third annual Street Eats festival in Milwaukee, a gathering for all things delicious and vehicle-based in the city. 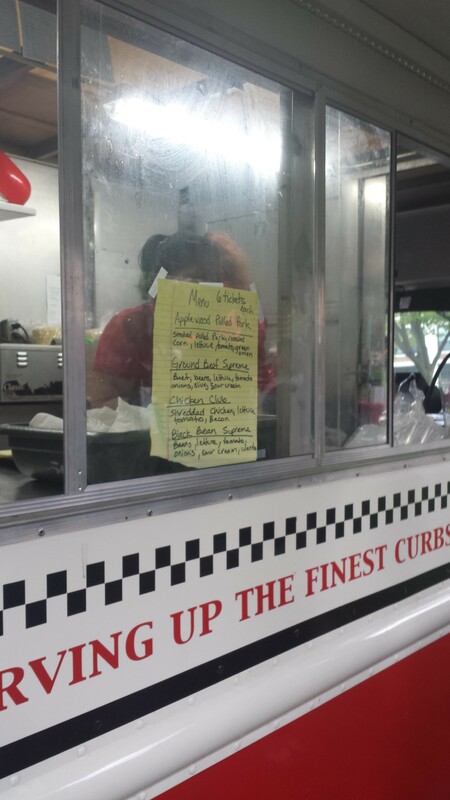 As per usual for these types of fair-fare festivals, enterprising businesses set up camp in the park, while the majority of the food trucks parked along either side of East Menomonee Street, along the park’s northern edge. Sydney and I arrived around 6:00pm, halfway through the events of the festival. 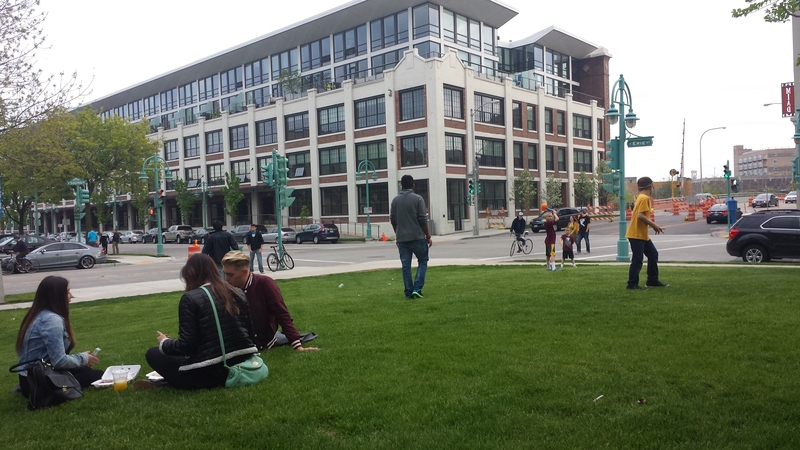 We had to park a couple of blocks down Erie (following the river), but the walk wasn’t bad, considering the breezy spring weather and slightly overcast skies. 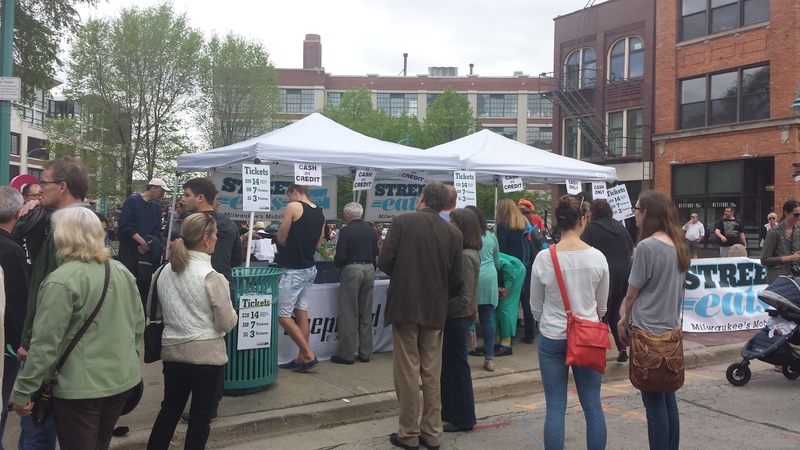 The main thoroughfare along Menomonee was packed with visitors, perusing the makeshift signs most of the trucks had set up for their limited wares. 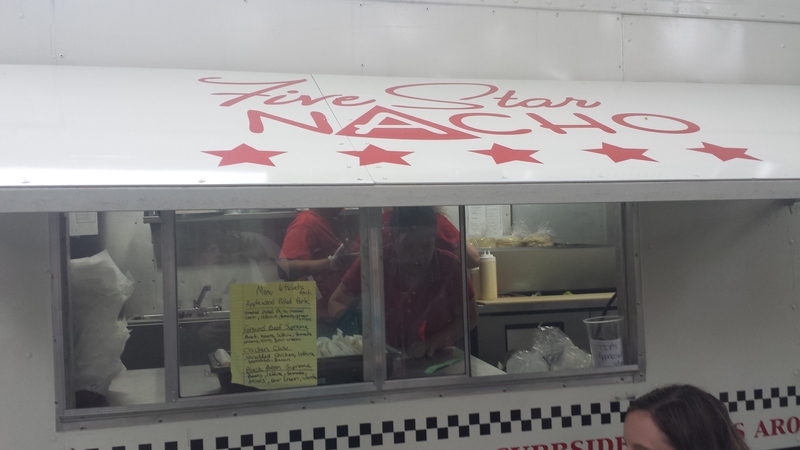 As expected for this type of event, most trucks were not offering their full menu, but were instead selling a limited number of items to ensure they wouldn’t run out. We dropped by the ticket booth, and (after some confusion involving a faulty card scanner) were able to pick up $20 worth of tickets, and a free Frisbee, the latter of which is now lying forgotten somewhere in the backseat of my car, I think. It made a good plate during the festival, though, as neither Sydney nor I are very good at throwing Frisbees (without sending them sailing into nearby traffic or bystanders). 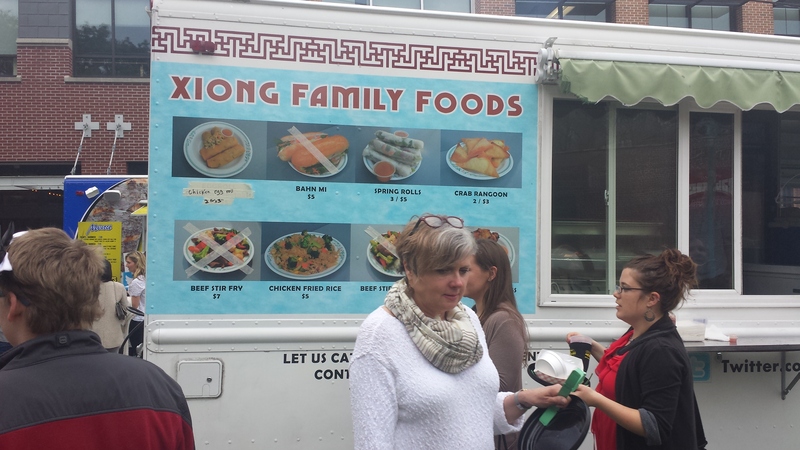 The mysterious Xiong Family Foods truck was there as well; notable to me for being the only truck I couldn’t find any information about on the Internet. They must’ve been doing well by word-of-mouth alone, as they were out of several products (including Banh Mi sandwiches, a dish I have yet to try) by the time we got there. 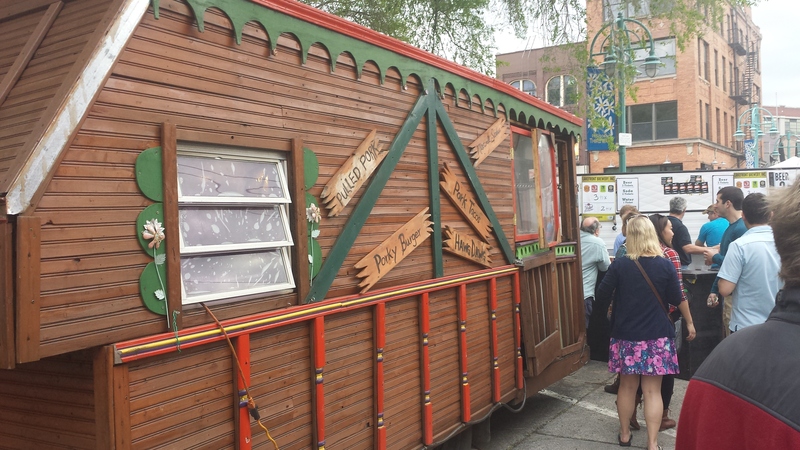 A personal favorite of mine, Hard Wood Cafe, was also present; notable for serving delightful pork products out of a purely wooden trailer instead of the traditional sheet-metal truck, Hard Wood Cafe had one of the longest lines at the festival (other than the beer line, of course). 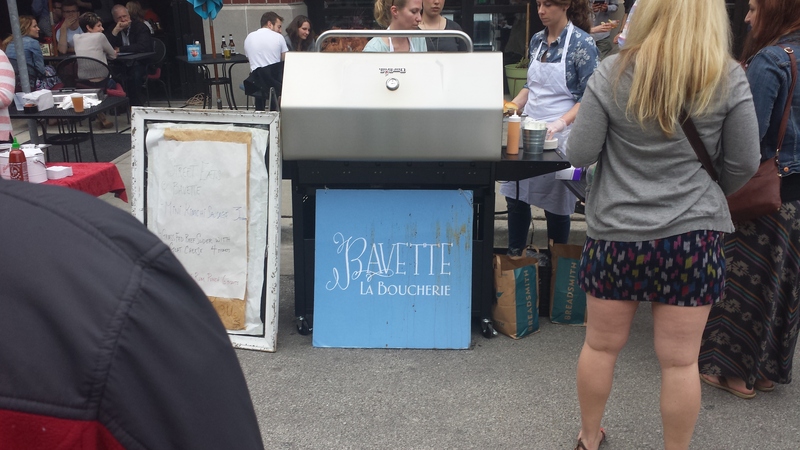 We decided against them as well due to the fact that I wanted to try something I hadn’t tried before, combined with the long line and some indecision between Sydney and I.
Bavette la Boucherie and Club Charlies, both brick-and-mortar institutions along Menomonee Street, had stands out on the street selling limited versions of their menus to festival attendees. I was tempted to try Bavette’s wares, but I figured I’d wait until I could try their restaurant proper for a real representation of their food. I’ve heard their charcuterie is delicious and fresh, since they operate as their own butcher shop, so you’ll probably read my review of them sometime soon. Trying to summarize them here would be doing them a great disservice. Club Charlies, on the other hand, looks more like a decent place to go in for a beer or shots than it does as a place to sample quality food, but I won’t judge them by their cover. 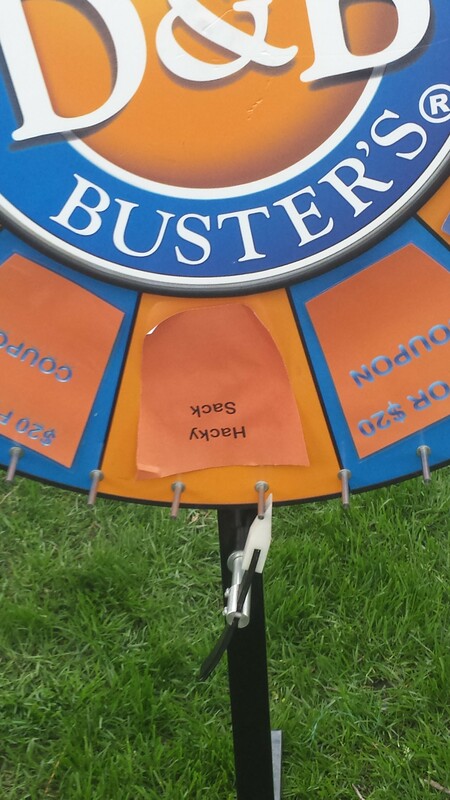 Before making our food purchases from the trucks, we decided to stop by the stand for Dave and Buster’s, which had a prize wheel set up in the grass next to a table full of cheap prizes. We both spun the wheel, hoping to get a gift card or discount, but instead we both ended up getting hacky-sacks. Just my luck, I guess. 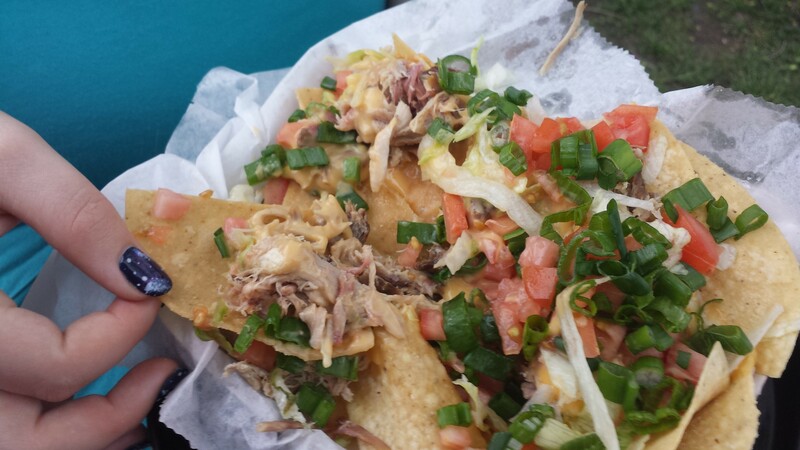 We decided on Pulled Pork Nachos (6 tickets) from Five Star Nacho, a truck which wasn’t on the original billing for the event. Apparently, they were added after the press for the event went out, or they were just sneaking in to try to capitalize on tip money. 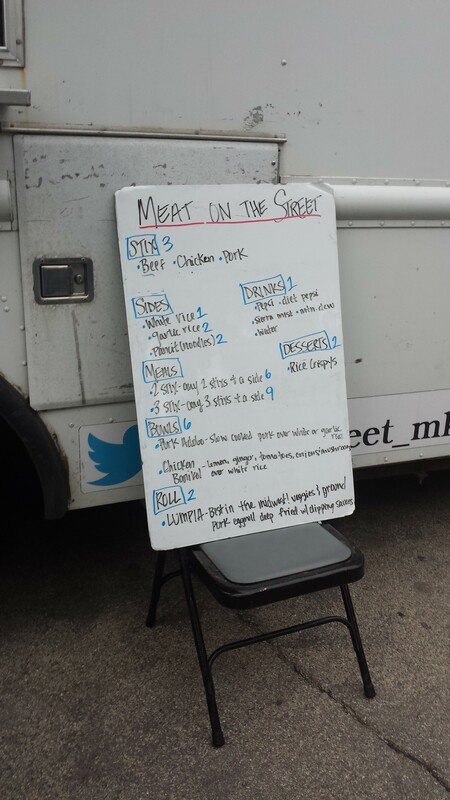 Either way, ordering from them (as I’ve read online is usually the case) was rather confusing; they had a painted-on menu on the side of the truck, a whiteboard menu out front, and a paper menu taped to the window. Only the last of these three menus showed what was actually available during the event. Our order took about 5 minutes to deliver, since we were about the fourth group waiting on an order. 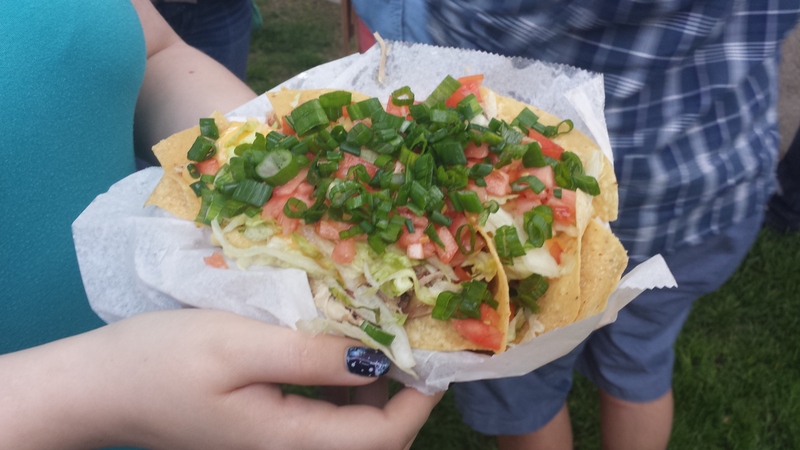 The food itself, though, was piled high with lettuce, cheese sauce and tomatoes, on a decent-sized serving of flavorful pulled pork, and topped with a ton of thick-cut scallions. Now, Sydney isn’t a big fan of onion, but I assured her that the sliced shoots (whatever they were) weren’t that spicy or bitter by taking a handful of them and popping them into my mouth; to my surprise, I didn’t end up completely dying from the taste of raw onion. The dish blended the cleanness of the tomatoes and onion with the almost-gamey flavor of the pork, and the fresh corn tortilla chips sagged just a little bit under the cheese sauce, causing us to have to fold them over the toppings to get a good bite. We emerged victorious from the pile, our hands and faces covered in bits of cheese, very happy with our accomplishment. 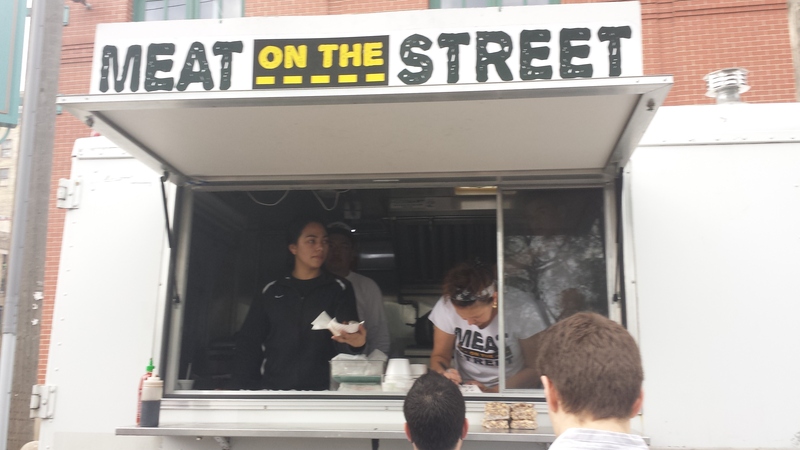 Our other stop-off during the event was at Meat on the Street, a Filipino-styled meat truck serving spicy beef, chicken and pork adobo in both stick and bowl form, over rice (white and garlic rice available). 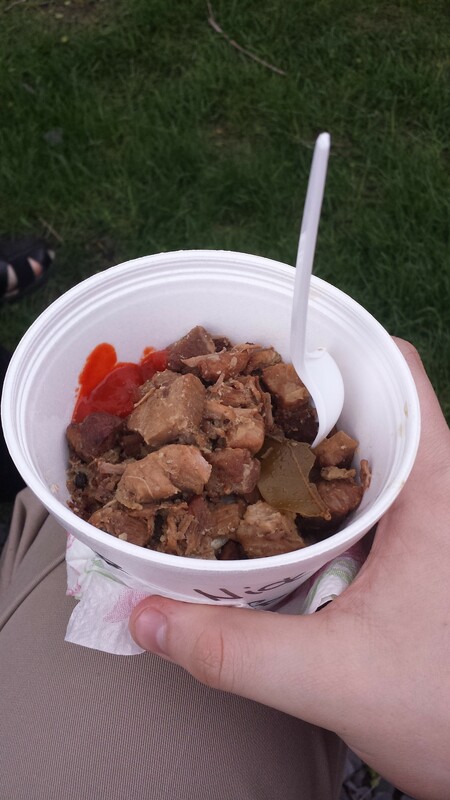 Because I wanted to share, I decided on getting a bowl of the Pork Adobo with Garlic Rice, which I immediately sided with a generous squirt of Sriracha. The bowl was HOT, by every definition of the word; the rice was straight out of the cooker, and I burned my mouth a couple of times trying to balance cooling it down and shoveling it into my greedy maw. The pork was cut into little chunks, and still had little whitish bits of parboiled fat and sinew that had not quite fallen off during cooking. The adobo flavoring (essentially, Hispanic allspice, for those not in the know) combined with the garlic rice and Sriracha gave it a hell of a spicy kick that never overpowered the raw flavor. In addition, the truck also sold soda and water for a ticket each, so we picked up a Pepsi and a Mtn. Dew, which beat the hell out of waiting in line for a half-hour for drinks that cost 3 tickets each. Sydney and I sat on the edge of the fountain area, eating our food and listening to the band that had come to play. I wished I had enough tickets for a beer, but neither of us wanted to get in the uber-long line. We stopped and took a few pictures in the modern-art sculptures along the park’s western edge before heading out to meet up with a friend. 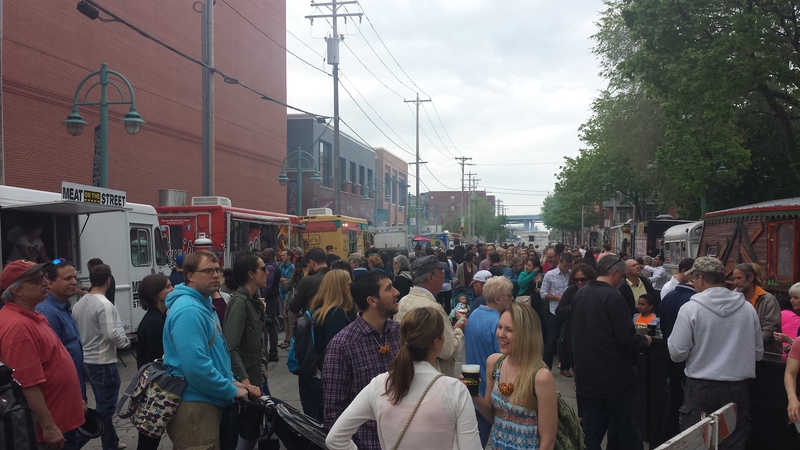 All in all, the event was fun, but the mood was brought down a bit by the cost, the clouds, and the long lines. 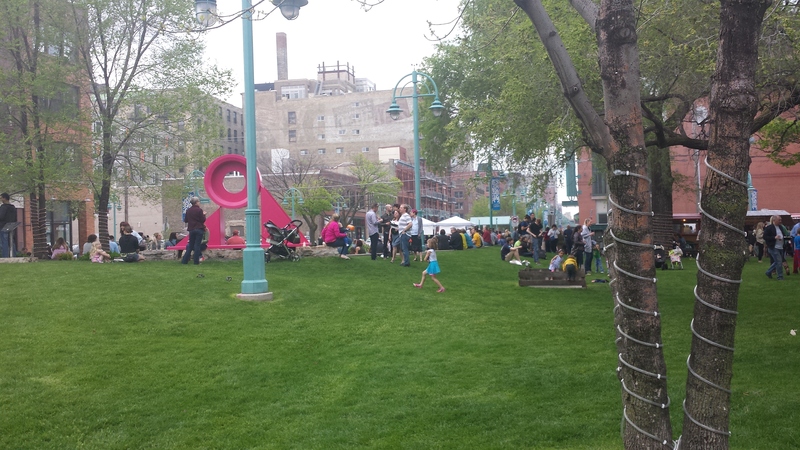 The park where the event was hosted was a little small for the number of people which showed up, and there was a definite lack of seating space compared to other events I’ve attended in the city. The food was good, and the entertainment was present, if not terribly entertaining. All that aside, though, I think it was a good way to celebrate the first real warm days of spring. < Previous Meals on wheels? Sounds good to me!